COLOSSIANS 3:23 KJV "And whatsoever ye do, do [it] heartily, as to the Lord, and not unto men;"
20Children, obey your parents in all things: for this is well pleasing unto the Lord. 21Fathers, provoke not your children to anger, lest they be discouraged. 22Servants, obey in all things your masters according to the flesh; not with eyeservice, as menpleasers; but in singleness of heart, fearing God: 23And whatsoever ye do, do it heartily, as to the Lord, and not unto men; 24Knowing that of the Lord ye shall receive the reward of the inheritance: for ye serve the Lord Christ. 25But he that doeth wrong shall receive for the wrong which he hath done: and there is no respect of persons. 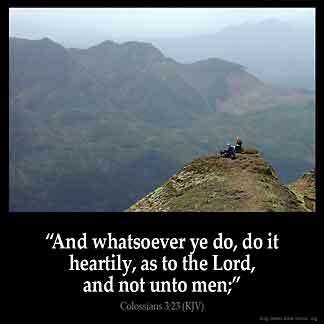 Whatever you are doing, let your hearts be in your work, as a thing done for the Lord and not for men. 3:23 Heartily - Cheerfully, diligently. Menpleasers are soon dejected and made angry: the single - hearted are never displeased or disappointed; because they have another aim, which the good or evil treatment of those they serve cannot disappoint. Col 3:23 And whatever ye do. See PNT "Eph 6:7". Whatsoever I do : I should do it in the attitude that I am doing it to my Lord Jesus : Even if when the person I am doing for is hard to do for because of something that I may not like about that person . I should look at them as though they are loved of Jesus Christ. Jesus did that for me when I was unloveable !!! This verse shows that no matter what we do in any area of life we should do so whole-heartedly to God. We must make sure that we give God our very best. He deserves nothing less. I think that God want's us to show his love thru us so other's will won't what is in our hearts.and come to the saving grace of jesus christ our lord.colossians 3:23+24 whatever we do work at it with all your heart as working for God not for man.it is the Lord you are serving not man.